2 School of Biological Sciences, University of East Anglia, Norwich Research Park, Norwich NR4 7TJ, United Kingdom. In 9 moss samples collected from Mexico, 6 tardigrade species, including 4 new records for the country, were found. The new records raise the number of known Mexican water bear species to fortyone. We provide a full list of the known Mexican tardigrade species and discuss some biogeographical and taxonomic issues. Key words: Eutardigrada, Heterotardigrada, fauna. En 9 muestras de musgo recolectadas en México, se encontraron 6 especies de tardígrados, incluyendo 4 nuevos registros para el país. Los nuevos registros incrementaron a 41 el número de especies de tardígrados mexicanos conocidos. Se proporciona una lista completa de tardígrados mexicanos conocidos y se discuten algunas cuestiones biogeográficas y taxonómicas. Palabras clave: Eutardigrada, Heterotardigrada, fauna. The tardigrade fauna of Mexico has been studied occasionally and in consequence it is very poorly known. To date 37 tardigrade species have been reported from only 8 of the 31 Mexican states, and 7 papers have been published on tardigrade fauna of Mexico: Heinis (1911), May (1948), Schuster (1971), Beasley (1972), Claps and Rossi (2002), Pilato and Lisi (2006), and Beasley et al. (2008). In this paper we provide a full list of tardigrade species previously reported from Mexico and include 4 new records found during this study. Additionally, some biogeographical and taxonomical remarks are provided on the species reported from the country. Nine moss samples were collected by the second author from Campeche, Chiapas, Mexico and Oaxaca states in the southern part of Mexico (North and Central America). Tardigrades and/or their eggs were found only in 3 samples (see the list below). All specimens were mounted on microscopic slides in Hoyer's medium. Observations and photomicrographs were taken using Phase Contrast Microscopy (PCM). Species were determined mainly on the basis of the key to the World Tardigrada (Ramazzotti and Maucci, 1983) and original descriptions. The list of localities from which positive samples were collected is as follows. 1, Chiapas State, San Juan Chamula, mosses from soil, 29.10.2007: 24 specimens + 5 eggs. 2, Chiapas State, Palenque, mosses from stone, 15.10.2007: 48 specimens + 10 eggs. 3, Oaxaca State, Monte Alban, ancient ruins of the Zapoteca culture, mosses from soil, 10.10.2007: 56 specimens + 3 eggs. Material examined in this study: 19 specimens. Remarks. New species report for Mexico. Up to now it has been recorded only from Europe, and South and North America (McInnes, 1994). Material examined in this study: 3 specimens. Remarks. Cosmopolitan species, recorded from many localities throughout the world; however, older reports should be verified given recent descriptions of many new species within the genus (Tumanov, 2006). Material examined in this study: 35 specimens and 8 eggs. Remarks. This is the second report of this species and also the first report outside the type locality (Costa Rica) (Pilato and Kaczmarek, 2007). Material examined in this study: 37 specimens and 3 eggs. Remarks. Species recorded from many localities in Europe, Asia, New Zealand, North, Central and South America and Antarctica (McInnes, 1994). According to Pilato et al. (2000), the only confirmed localities are in South America. This is the first confirmed record of this species in Central America. Material examined in this study: 24 specimens and 5 eggs. Remarks. New species for Mexico. Up to now this species was known only from southern Europe, northern Africa, Australia and Greenland (McInnes, 1994). Material examined in this study: 10 specimens and 2 eggs. Remarks. New species for Mexico. Up to now this species was known only from southern Europe (Bertolani and Rebecchi, 1993). This paper adds 4 new records to a short list of known Mexican tardigrade species (41 species). 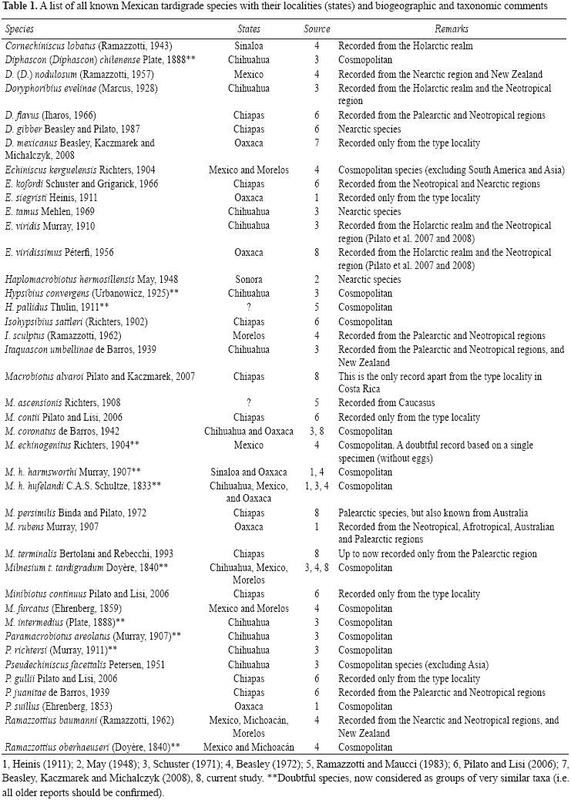 All these species were reported from only 8 Mexican states whereas in other 23 states data are lacking (Table 1). Moreover, nearly half (16) of the known species are considered cosmopolitan, which means that these records are doubtful and need to be confirmed. Interestingly, 5 species were reported only once from their type localities. The remaining species are known from a range of biogeographical regions: Neotropical (10 species), Nearctic (6), Palearctic (6), Holarctic (3), Afrotropical and Australian (1). A large proportion of Neotropical species suggests a major influence of this region on the tardigrade fauna of Mexico, and the presence of species from the Palearctic, Nearctic and Neotropical regions indicates that Mexico is situated on the border of 2 large biogeographical regions, the Nearctic and Neotropical. Nevertheless, the low number of known Mexican tardigrade species currently prevents any biogeographical analysis. We are grateful to Alvaro Herrera (INBio, Costa Rica) for his translation of the title and abstract of this manuscript to Spanish. The research was partially supported by The Polish Ministry of Science and Higher Education via the programme "Iuventus plus", grant no. IP2010 015570 to ŁK.